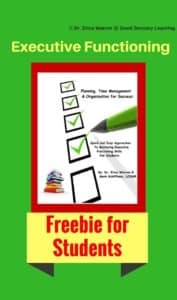 Do your students struggle with studying? Although you are providing adequate time and materials for your students, do you find they just don’t know what to do? 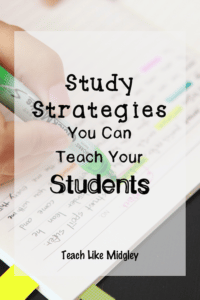 Do your students lack the study strategies they need? One of the biggest academic challenges I see from students who are new to middle school is not knowing how to study. In elementary school, many students are accustomed to coming to class, doing the work, and performing just fine on tests. Once they reach middle school, many of them experience a bit of a reality check. They may do well on the first major test because it’s a new school year and everyone is on top of their game. But as second quarter approaches, academics become progressively more challenging, and true habits of students shine through, many test scores take a tumble. Once students realize they need to study, they don’t necessarily know how to study. Many think looking through their textbook is studying. I have heard students say “I studied last night for over an hour!” yet when I ask them a few key questions, they do not remember the answers. It is super important we as teachers take the time to teach students how to study. Which is not always an easy task. Sometimes it feels we are beating our foreheads when we are teaching. Which is exactly why I drafted this easy to use list of strategies for helping your students learn how to study!